1958 Porsche Pit Stop Le Mans 24 Hours Jesse Alexander Postcard Post Card RARE!! 1958 German Grand Prix Nurburgring Jesse Alexander Postcard Post Card RARE!! 1960 Phil Hill USA Ferrari Monza Italy Jesse Alexander Postcard Post Card RARE!! 1960 Georgio Scarlati Nurburgring Jesse Alexander Postcard Post Card RARE!! 1958 Stirling Moss Vanwall Monza Italy Jesse Alexander Postcard Post Card RARE!! 356porsche has no other items for sale. Details about 1962 Porsche Dan Gurney Nurburgring Jesse Alexander Postcard Post Card RARE!! 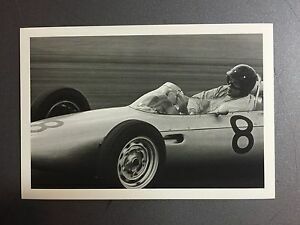 1962 Porsche Dan Gurney Nurburgring Jesse Alexander Postcard Post Card RARE! !